be sure to keep the sweaters away from the flames. and World Market just to name a couple. So, my version of Debi's vases are a copy cat of a copy cat. Debi writes that this project is fast, cheap and easy and it is. white/beige sweaters are her favorites to use in this project. project but I needed to find some sweaters at the thrift store. Debi used cylindrical vases so that's the first ones I attemped. get as many vases covered as possible so I kept them smooth. excess to use it on another vase. knit stitches would unravel immediately but that did not happen. The leftover arm part was put on a shorter vase. up showing the wrong or "purled" side of the sweater. sleeves were only 3/4 long so they only covered one vase each. it could be covered with a ribbon to hide the raw edge. the first Barbies came out on the market. It was fun "dressing" these various shapes of vases. you can also pull it over curvy vases, within reason. start with the cut edge and not the cuff edge of the sleeve. sneak up from the backside of a cuff and get the vase in after all. then tuck the cut edge into the sleeve's cuff. on the backside (against the vase) and no one will see the pin. I decided to use a winter brooch as the pin for this vase. that normally bloom in the Spring. 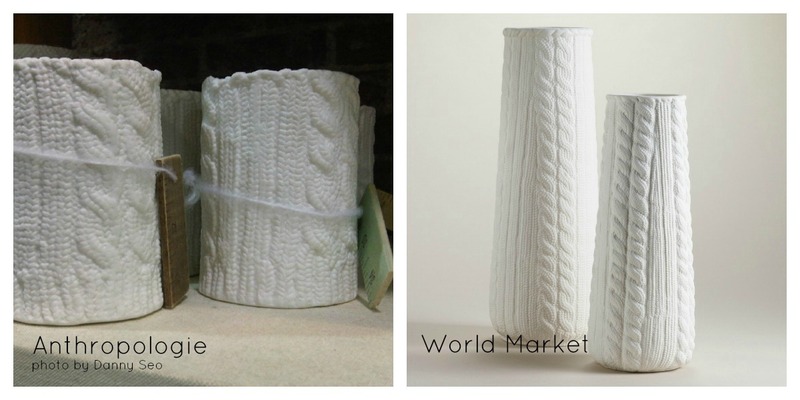 of to make even more sweater covers for your vases. These are very very cute. Thanks for telling exactly how you did them. I'd love it if you linked up at my party....Mod Mix Monday. You did an awesome job on the vases, Gayle! I saw this idea on Debi's blog and have been meaning to make some, but haven't gotten any done. This is too cool for school. 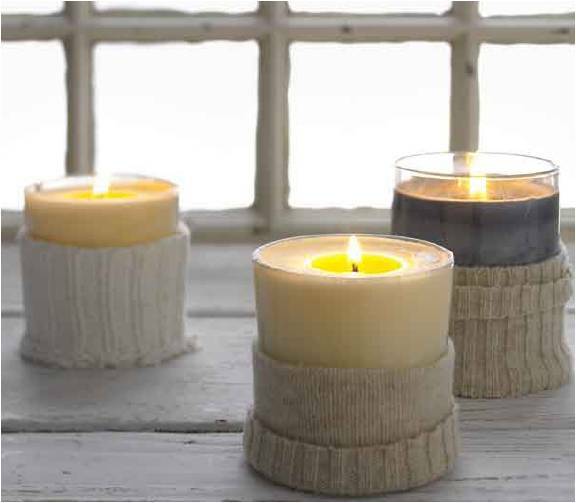 I have used men's cuffs for candle covers, but this is so cozy looking. Wow, old sweaters are coming in handy for a lot of things. I absolutely love this idea and can't wait to give it a try. 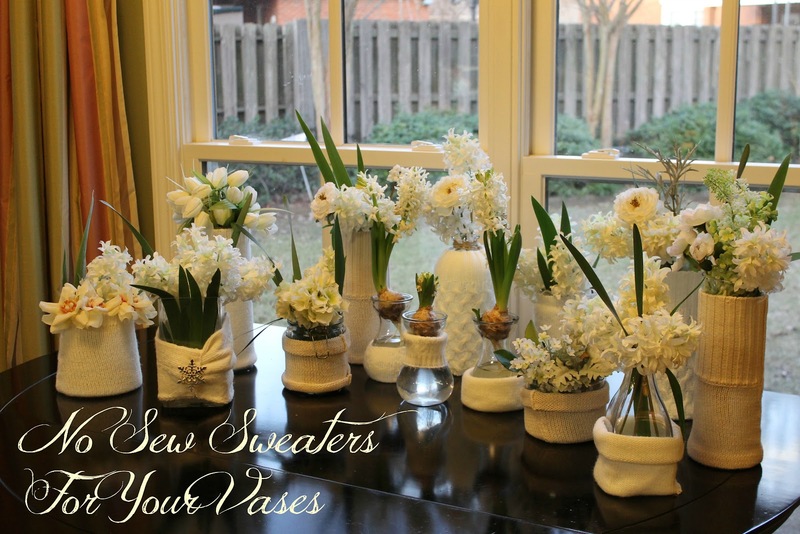 What a lovely way to "dress" up a vase or candle-holder! What a great tutorial! You made this nonsewer very happy. Your display is soo lovely! Great post and thanks for the visit! Great tute and beautiful bulbs! Thank you so much for stopping by for a visit to see my drop cloth flowers. Now you got my thinker thinking about sweaters again.....! Very very cute and clever! I am a new follower, can't wait to see what you're up to next! What a beautiful work, you are amazing. Thank you for stopping by and comment on Stuffed shells. I am your neww follower. I am glad your flowers & candles are keeping warm. Seriously, this is a great idea and the display is so pretty!! Love these so much I'm going to dig through my closet and come up with some sweater for cutting! These cuties will for sure be featured at my party next week. Thanks so much for sharing them. Now that's just the cutest idea ever!!! The vases looks so pretty and cozy! Great idea and one I will definitely try out. Gayle, I just love this project and I appreciate you sharing it at the Open House party. 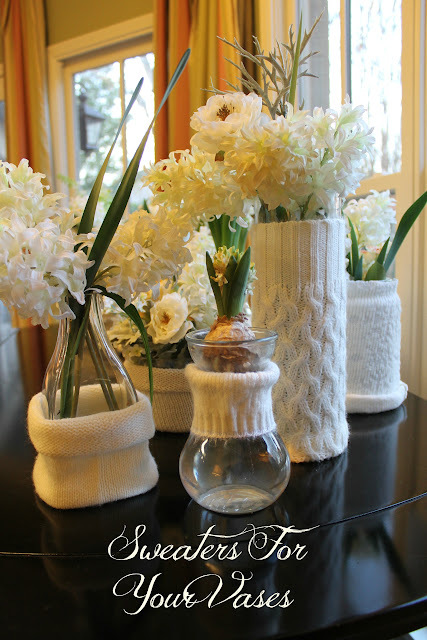 The sweater vases are so adorable. Such a cute idea! I think it's something that even I can do! I love the way you displayed them in all white. A very sweet and romantic look. Thanks for sharing with us. These are just darling. WHat a neat idea. So glad you shared it the party...very inspiring. Was partying at Mod Mix Monday and saw that your sweater vases were featured and I just had to come on over to see how you did. These are beyond amazing. Lovely. What a cute idea! I just made a Christmas stocking out of a sweater but think I threw away the sleeves! I love these and all the different shapes and variations. Thanks so much for the great tutorial. Very cute!! I have two leftover sleeves from my Christmas stocking from a sweater project that I've been wanting to do this with...Thanks for the inspiration. Love these! So cute!! I'm a new follower through GFC.